Idiyappam, Pongal and Coffee: An Authentic Breakfast at Hotel Sarvanna Bhavan in Chennai. Transit stop-overs or layovers afford a few moments of pause in the continuously playing reel of the journey gone by and the journey up ahead. Stop-overs also afford choices – How about some snooze time or time to wander around, may be? For most of the times, I say – Oh well, I want to EAT! Food is one thing I look out for in transit stopovers in the case of long journeys. Why, it’s a great time to fill my stomach tank so that I can enjoy the rest of my journey. This was exactly the case when I last went to Tirupati. I had my flights booked from Mumbai to Chennai and from thereon, a connecting train for Tirupati, giving me a transit stop-over at the Chennai Railway station. My early morning flight meant I was at the Chennai Railway station during the peak hours of breakfast time. Needless to say, I was hungry and craved to seek some breakfast chaat in Chennai. Guess what? My answer was right there! Hotel Sarvanna Bhavan located at Chennai Central Station came to my rescue. 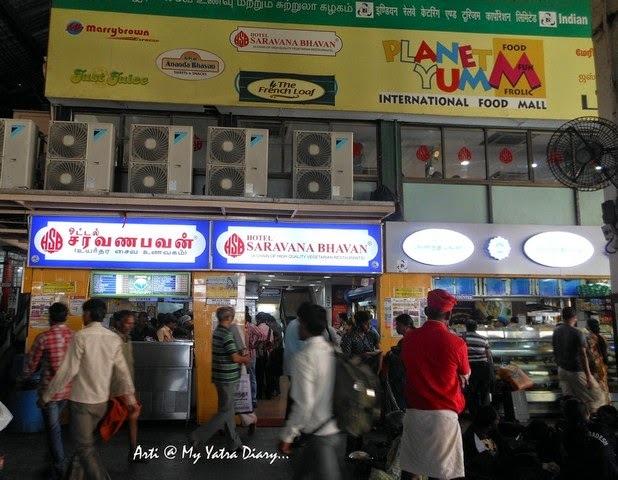 Hotel Sarvanna Bhavan or HSB in its abbreviated form is a very crowded, really popular chain of vegetarian restaurant that serves quality food not only across India but across the globe. In Chennai, HSB stands in one corner opposite of platform number 9 and 10 at Chennai Central Railway station. It has a standing area downstairs where you can help yourself or you could climb all your way up to the service hall on the first floor if you wish to sit down, get served and eat. However, extra service charges apply upstairs which is not much and well worth it if you are tired and wish for some peace and space. Personally, I would suggest the service seating area upstairs as it is less crowded and gives you some breathing space. I took a corner seat on the first floor near the glass paneled windows where the sight of the rushing commuters and the chaotic scene downstairs while sipping my coffee made a sight to cherish. Also known as string-hoppers or Noolputtu, Idiyappam are delicate string noodles made of roasted rice flour. The rice flour is kneaded into soft dough using boiled water and oil. This dough is then filled into a tool called the Idiyappam presser/mould and pressed into thin delicate noodles ready to be steamed. Once the noodles finish steaming, they are removed from the steamer and served on a platter along with a spicy vegetable curry and coconut chutney – both of which taste incredibly delicious. 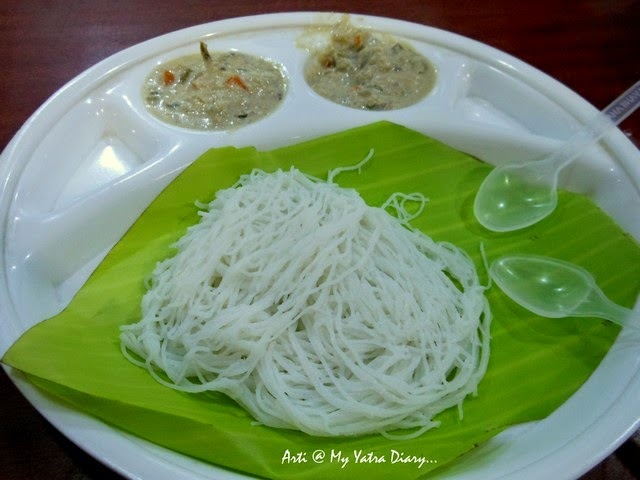 On its own accord, the Idiyappam is rather bland but when eaten along with the vegetable curry and the coconut chutney, the taste shoots into something that is truly unique and flavorful. Idiyappam is a popular breakfast dish in Tamil Nadu and Kerala, a signature dish of the South Indian cuisine. It’s really light on the stomach and easy to prepare, hence makes for a great meal to kickstart the day. Pongal is a simple but very appetizing rice and lentil melt-in-your-mouth pudding with a rich seasoning of ghee. What makes this dish really interesting is its association with a very popular harvest festival from Southern India by the same name, Pongal. Pongal in Tamil simply means to overflow or run in excess, a celebration of bounty and affluence. On the same lines, when the dish is prepared in the traditional manner, especially in the rural parts of India, a clay pot containing a concoction of rice, lentils and milk is left open on the wooden fire to spill over. This spilling over is considered a beautiful expression of gratitude to the Sun God for a bountiful harvest and a prayer to bestow similar goodness in the coming years. The cooked pudding is then tempered with a host of Indian spices that includes hing, whole black pepper, cumin seeds, cashew nuts and curry leaves along with a ladle full of pure ghee and eaten along with spicy vegetable sambhar and coconut chutney - flavors of which blend together lending the dish of Pongal a taste that it not only highly scrumptious but also healthy and easy to digest. I washed everything down with a glass of hot, milky and frothy South Indian filter coffee (or is it Kaapi?!) – Too good for any words here - a perfect refreshment for the journey ahead! There are other things that the chain serves as well like the traditional Dosa, Idli, Wada, etc. which I couldn't have... well, there's always a next time! Meal Timings: 10.30 AM - 4 PM. 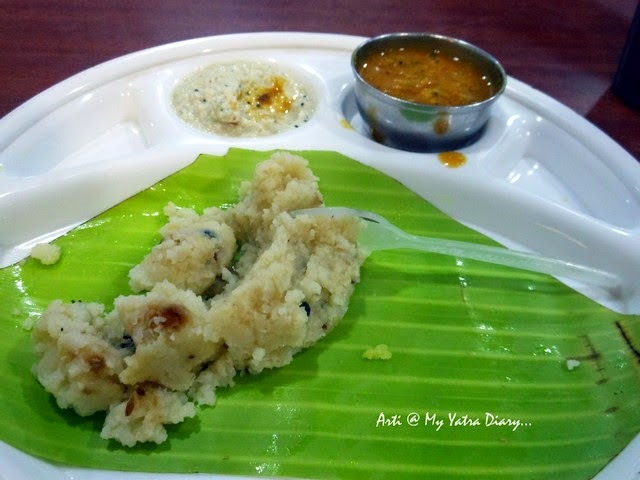 This was my experience of having an authentic South Indian breakfast in Chennai? Do you have any recommendations for best snacks or chaat in Chennai? This title totally drew me to the post. Oh my my! How much I miss these, and HSB! I love noodles and I love lentils but the Pongal sounds like it might be a tad too hot for my taste so I think I'll stick with the Idiyappam as long as it wasn't too spicy. It seems you had a great time at Chennai Express unlike SRK. I have been to Chennai twice, but haven't been to Sarvana Bhavan. However, I had Idiyappam at Taste of Kerala at Fort, Mumbai recently. I agree with you that it tastes great with curry. Wow... amazing as usual, Arti! I don' fancy authentic South Indian food too much but this sounds delicious! I've been there, the best taste food while im in tamilnadu. I try twice in chennai near the bazaar street and in kanchipuram. Real south india taste. Good to see you enjoy South India Cuisine, Arti! Btw, there are two versions of Pongal, actually. The one with the milk has jaggery as well in it and is the 'Sweet Pongal' that is, as you said, boiled over in the Harvest Festival - Pongal. What you normally get in HSB or elsewhere in TN as the daily breakfast dish is the 'Ven Pongal' - the hot and spicy version. I have had breakfasts in this hotel many times in the past. Always same taste and quality. I ate in Sarvana Bhavan even when I was in Dubai..Great taste and consistency of the recipes remains the same..
Wah! What breakfast! And I love finish off my breakfast with that filter coffee. Another yummy post and so neatly explained for those who are not familiar with these south Indian dishes. Nice pictures too. Awesome post, Arti. Now I want some filter kaapi!! Photos tell us a lot...thanks for sharing. Very tempting description Arti.I love south Indian food. wow my hubby's fav restaurents ....lovely post ! 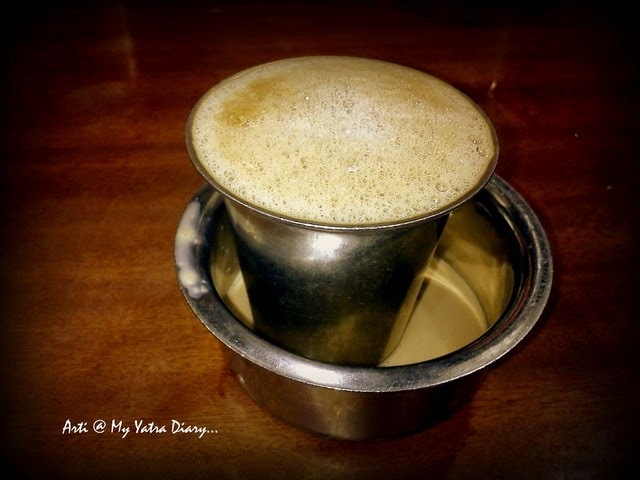 Great post on Idiyappam, Pongal and Coffee: An Authentic Breakfast at Hotel Sarvanna Bhavan in Chennai. nice place i would sat .. I was checking continuously this blog and I’m impressed! Very useful information particularly the last part :) I care for such info much. I like coffee and pongal in chennai. When I came to India on tour, I visited Chennai and tried the local dishes, they satisfy taste buds, Indian recipes are full of spices. Pongal with vada is a combination , FILTER COFFEE almost raises fthe nerves and make them active.Hotel Sravan Bhavan is popular brand name in Chennai. 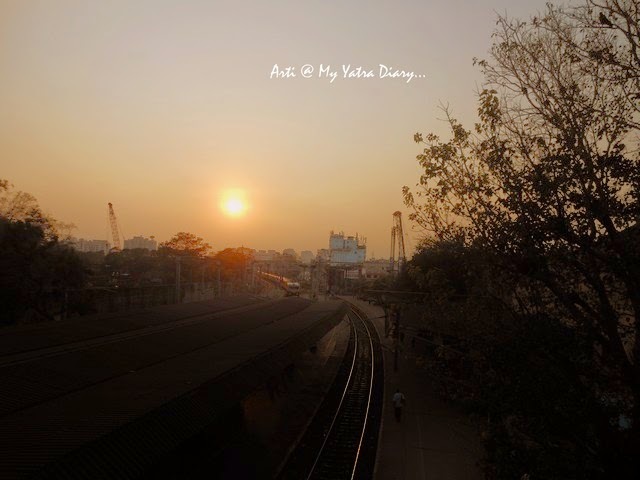 I have tasted at HSB many a times , But the Pongal and Idiyaappam look more enticing on your photograph ....Arti..
A Song of Love: Hyderabad and The ISKCON Temple.